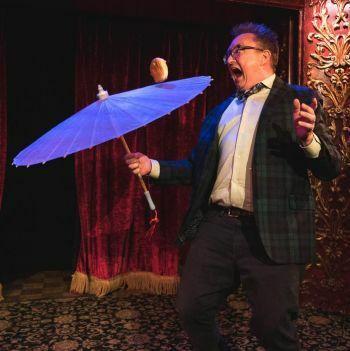 Michael Rayner’s show has been described as “preposterous brilliance” and “whacky jugglement,” a combination of hilarious tricks and stunts with uproarious stand-up and a bounty of improvised fun. You’re never sure what’s coming next! His signature trick is spinning a McDonald’s cheeseburger on an umbrella which garnered him appearances on America’s Got Talent, The Late Late Show with James Corden, and The David Letterman Show. Other TV appearances include Sesame Street, The Extreme Gong Show, Thirty Seconds to Fame and various local TV shows. He’s a favorite of Nickelodeon Television having performed his antics on What Would You Do? and Nick Arcade. He frequently pops up in TV commercials. He was a weird scientist for IBM and a dork washing a cardboard car for Saturn. He played a hapless gas station attendant who tries to take a photo of Elvis in an Energizer battery commercial and has appeared with Ringo Star, Jane Seymour, and Anthony Quinn promoting other worthwhile products . Maybe his proudest achievement was having Frank Sinatra personally approve him to promote his compilation CD for a Capitol Records commercial. Michael has done warm-up for many sitcoms including That ‘70s Show, Reba, Dharma and Greg, Stark Raving Mad, Then Came You, Two of a Kind, Two Guys and a Girl and the specials Thou Shalt Laugh ll and Home for the Holidays. Michael is married to Moira Quirk and has two little girls who all help him dress.